It all began just after World War II when Paul Patz, a young farmer, saw a need for a rugged, efficient piece of equipment that would ease the drudgery of his daily chore of cleaning barn gutters. After working for two years to improve his design, Patz sold his first barn cleaner in 1948, which featured the one-piece, heavy-duty link that Patz had invented and patented. 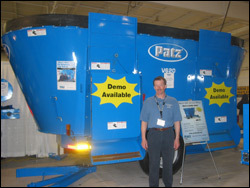 Following on the heels of his successful barn cleaner, Patz designed and produced silo unloaders for tower silos, and then added conveyor systems and mechanical feeders for cattle over the years, noted Patz district representative Kevin Habeck, who helped coordinate the Patz display at the recent Wisconsin Public Service Farm Show. Habeck explained that the company then added manure pumps and manure storage facilities to its product lines. “In the last 10 to 15 years alley scrapers for freestall barns have also become an important part of our production,” he said. Today, total mixed ration feed mixers are also one of the company’s main product lines, Habeck confirmed. Several of the large Patz vertical TMR mixers displayed at the farm show attracted plenty of attention from show attendees. Habeck reported that although TMR mixers have been used on Wisconsin farms for three decades, there have been significant design changes that make today’s units much more efficient. “They’ve gone from cement-mixer-type barrel mixers to auger-style mixers that used three or four augers to mix the feed materials in a box,” he explained. Habeck stressed that vertical TMR mixers are available to match nearly every type and size of farm operation. “For the smaller dairy producers we have stationary models powered by electric motors that have mixing capacities from 270 to 350 cubic feet,” he noted. Habeck emphasized that Patz is proud to be a Wisconsin-based mixer company that still has manufacturing facilities in the state. “With our Pound office and production plant, we have more than 5 acres under one roof,” he said. * Reprinted with permission from the Wisconsin State Farmer.